What underpins graphic strength in imagery? The 1920s was a special time for graphic novels (i.e. narrative books featuring sequential images without text). 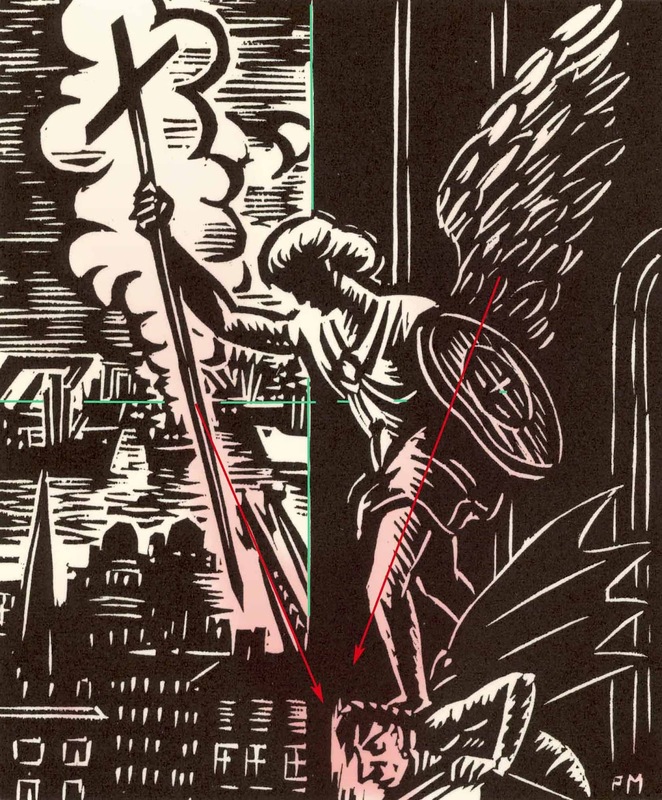 This was the period when the first wordless books were published and one of the artists who played an instrumental role in promulgating this purely visual way of storytelling is Frans Masereel (1889–1972). 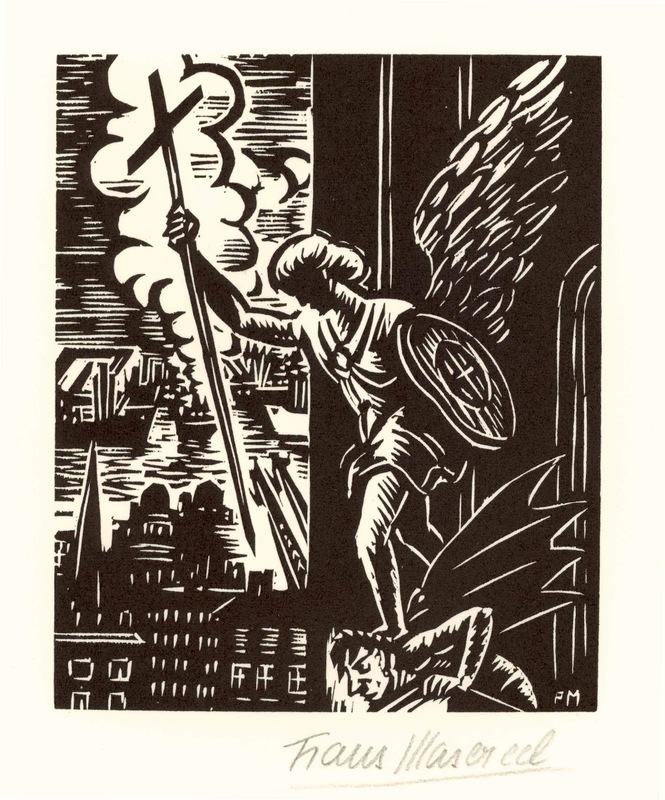 Beyond Masereel’s role in revitalising the woodcut tradition for his book illustrations, a key attraction of his work and its influence on fellow illustrators (most notably Lynd Ward) is the graphic strength of his prints. 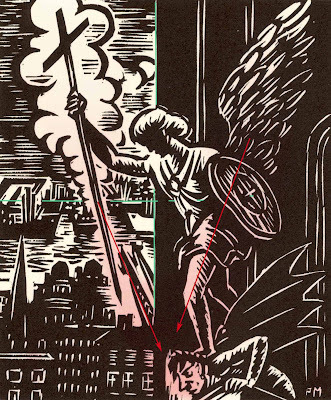 By this term I mean that his prints have the very desirable attribute, especially in book illustration, of being able to catch and sustain a viewer’s attention and to express meaning clearly. The following discussion focuses on explaining this strength with regard to Maserreel's woodcut, Angel (see below). Condition: Strong impression and in pristine condition with blank verso. I am selling this print for $235 AUD including postage and handling to anywhere in the world. Please contact me using the email link at the top of the page if you are interested or click the “Buy Now” button. Broadly speaking, the graphic strength of this print rests with two properties: the simplicity of its composition to express meaning and the arresting use of line to portray light and dark. Regarding compositional simplicity, Masereel employs symmetry to divide the image centrally, by the vertical edge of a wall. More subtly, he also divides the image horizontally, by the alignment of distant ships (see below). Overlaying this formal arrangement and spanning from the top of the composition to its lower edge is a symmetrically placed “V”-shape created by the angle of the angel’s cross-topped lance and the angle of the angel's wing (see below). This “V”-shaped rhythm is the critical element giving the print its graphic potency and meaning. I see the perceived angles of the “V”-shape as inviting my eye downwards to a demon that the angel subjugates. In short, the simplicity of symmetry underpinning the composition draws a viewer's attention to the narrative of godliness trampling on evil. 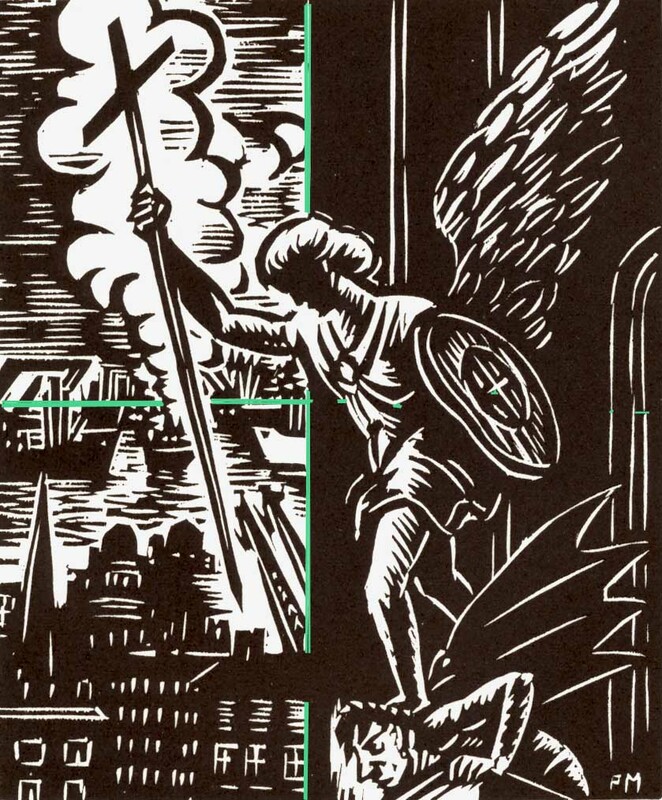 Regarding Masereel’s use of line that gives the image its graphic strength, the arrangement of the composition is literally of pivotal importance. The vertical division in the composition (described above) is like a fulcrum balancing and separating the line work portraying a sunlit (moonlit?) harbour scene on the left side of the image from line work portraying a dark slice of architecture on the right. What makes the lines on the left so dramatically different to those on the right is the contrast between black lines (often described in technical terms as positive lines) shown on the left and white lines (negative lines) shown on the right. This contrast of two different types of lines separating the realm of light from that of darkness is not accidental. In fact it is so intentional that the effect takes a considerable foresight and effort. To create the black lines on the left side of the image Masereel carefully cut away the woodblock so as to leave in relief those areas that were to be inked and printed as positive lines. This is a demanding process as each line to be printed must be rationalised as if it were an island-like shape on the block where the artist has not physically made a mark. Making the process even more demanding, each untouched shape on the block must also be viewed as a line shape that will ultimately be printed as a mirror image on a sheet. Fortunately the creation of white lines is much less demanding. To create these lines Masereel cut directly into the plate to create the void spaces that print as negative lines. Graphically strong images, like Masereel’s Angel, consist of more than just compositional simplicity and bold contrast of line to attract and sustain a viewer’s interest. All the elements and principles of design play their roles in creating a memorable artwork. Nevertheless, these two components, when co-ordinated to address the same overriding meaning, are arguably the most important and the easiest to control by an artist.